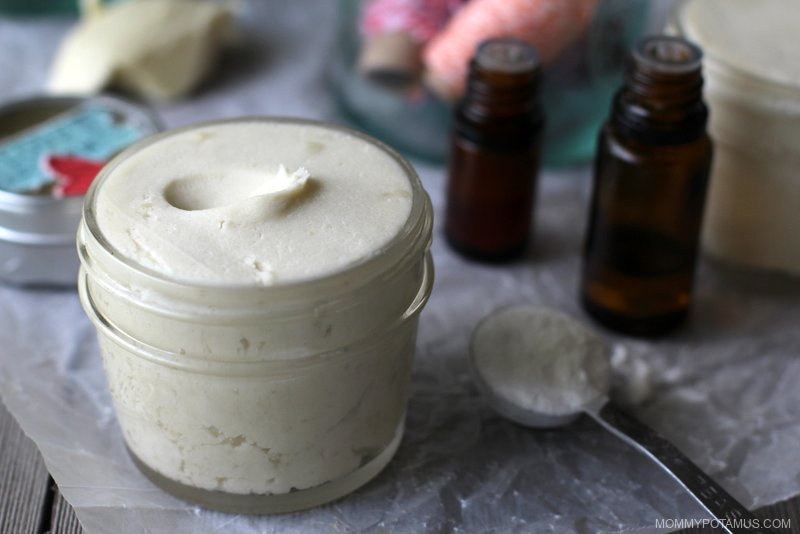 You Are Here: Mommypotamus » Blog » Beauty » Easy Homemade Deodorant That Really WORKS! 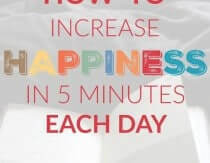 Heather Dessinger 386 Comments This post contains affiliate links. Way before I posted my “No I didn’t stuff my face with Cheetos“ tooth whitening recipe and started making my own shampoo, I was warning my college boyfriend (now husband) about the toxins he was putting on his body. To show me that my concerns were being taken seriously, he decided to take steps to ease his toxic burden. By giving up deodorant. In the summer. In TEXAS. Not the “sacrifice” I would have chosen, but it was pretty clever on his part. Rather than give up something that would bother him, he ditched the product whose absence would bother me. A lot. So I went to the health food store and picked up some options, but nothing worked. That’s when I discovered a cheap, non-toxic solution that’s incredibly easy to make. Don’t let the simplicity of this recipe fool you, though – it’s been field-tested in the 100+ degree heat of Texas summers and proven its worth. So, what’s wrong with store-bought deodorant? Now, maybe you’re wondering why was I worrying about this in the first place. It’s not like he was eating his old deodorant and other personal care products. Although that’s true, hormone and nicotine patches work because our skin absorbs a lot of what we put on it. And the stuff in conventional deodorant . . well, some of it has serious safety issues. Triclosan, for example, is a common ingredient that Minnesota banned over concerns that it may contribute to the development of superbugs. 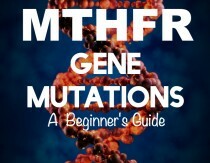 Studies indicate that it may disrupt normal thyroid function and alter hormones. Other common ingredients are aluminum – which is present in some “natural crystal” deodorants and has been classified by an oncologist as a genotoxin and hormone disruptor – propylene glycol, parabens, and “fragrance,” which often includes phthalates. For more info, check out my top five reasons to ditch conventional deodorant. Each of us has a unique body chemistry, which is why scents such as this vanilla body spray smell different on different people. When it comes to deodorant, our personal body chemistry plays a huge role in what works and what doesn’t. Some people need the full-strength option – that would be this recipe – while others find full-strength irritating and need a deodorant recipe formulated for sensitive skin. There’s also a homemade stick deodorant, but I like this recipe because it’s faster and easier. Also, if you’d rather buy natural deodorant instead of make it, this is a great option that wasn’t available when my husband tried store-bought options. When I started making this recipe I used coconut oil as the base. However, I’ve found that skin soothing shea butter is a better option because it’s not greasy and absorbs quickly, which is super important if you’re getting dressed in a hurry. Are you ready to kiss your store-bought deodorants goodbye? Alright, here’s the recipe! In a deep bowl, mix baking soda and arrowroot powder (or cornstarch together). Using your hands or a fork, work in the shea butter until it looks like very crumbly dough. Add in essential oil if using and then whip the deodorant together using a hand mixer. It will seem too dry at first and you’ll wonder if it’s really going to come together, but it will. You do need a deep bowl, though, because in the initial stage of mixing you don’t want the powder to go over the side of the bowl. Transfer to a clean glass jar – I use a 4 ounce jar like this one. Using your fingertips, scoop out a very small amount of deodorant – really, a little goes a long way – and rub it in your underarm area until it’s invisible. The deodorant will absorb quickly and keep you smelling fresh, but if you want extra dryness protection you can apply a layer of arrowroot powder over the deodorant using a makeup brush. Yeah! Thanks for posting this! I’ve tried two aluminum free deodorants including Tom’s and Terra Naturals. They don’t work very well on me. You’re so welcome . . . and just in time for summer! since there are so many posts about rashes and burns and such, why not post a reproportioned and “substitute” ingedredient recipe for us “make a change in the recipe” challenged ones?? I would like to see something that uses something other than baking soda. May I add that I have empty roll up type deodorant containers but wonder if this recipe would be too smushy to apply (what might I do to made it harden enough to pour in these plastic containers to roll up & apply. I’m married to a man who really doesn’t like change. At least the application being the same if possible would help! Thank you in advance for your thoughtfulness. What an awesome person you must be. Hi Marian, it’s a bit too smushy (or crumbly if not enough coconut oil is used) to work well with a deodorant container, but there are other recipes using butters like shea and cocoa that may work for you. I am new to this website, but what I have done for the last few years is after washing under my arms in the A.M. , I take a cotton ball and wet it with a little distilled vinegar and wipe well under my arms to get rid of natural bacteria. I then pat a little Johnson & Johnson cornstarch baby power under my arms and spread a stick of deodorant over this which I found in the health store. It works pretty well for me. I’m going to make Heather’s deodorant when I get all the ingredients, but I’m still going to prep under my arms the same way before applying Heather’s deodorant. I hope this helps keep your underarms dryer. Hi. I have made my own deodorant but it doesn’t last all day, maybe half. I use coconut oil, cotnstarch, a little baking soda, essential oils, vitamin e & Shea Butter. Do you have an idea as to why it’s not lasting all day? Were you able to make the deodorant last all day? I would like to make it last all day if possible? Try her tip of putting Arrowroot powder over top for extra ooph. As a professional makeup artist for years this “trick” is used all the time. You can use a powder puff and gently sort of roll & press the powder onto your deodorant or a light brushing of powder will do. This really “sets” your deodorant (or any cream/liquid etc.) onto your body. If it’s still not cutting it you can always make a mini stick version (they sell actual deodorant looking sticks that are quite small & thin, they look just like reg. tubes so much so many ppl buy them thinking they are reg. size tubes & end up upset) I like this option vs typical “travel deodorant” containers because those are still fairly bulky to haul around but you could make a smaller one & apply 1/2 way through the day. Or another idea: simply make a rollerball with the EOs of your choice (geranium is a natural deodorant & tea tree as Heather explained is wonderful) and just roll on a bit of the EO mix to fight any odors you feel like you get halfway thru the day! I hope this helps you a bit. Might have to putting a little more baking soda, I know baking soda can be strong or use Arrow root instead? In one comment lime is mentioned, what about trying it in the mixture, do you think it would keep? The baking soda darkens my underarm. Why is that ? I’ve noticed my under arms get dark and peel every couple of weeks with all of the baking soda in home made deodorants. I just use an enzyme peel when that happens. hi hi. love your site and recipes. in the natural deodorant recipe; is one of he ingredients to help with keeping you a little dry? i don’t sweat a whole bunch, but the area since going without anti persp. is just always kind of clammy. it feels gross. Thank you so much for posting this! My husband has been trying different store bought natural deodorants but all left him smelly. We tried this recipe and it has given him amazing results! The ultimate test was him mowing the lawn in 90 degree Florida humid weather. He smelled better than I did when he was done and I was in the AC the whole time. Works wonders but a bit too strong for my sensitive pits. Do you have any issues with cocoa butter? If not, these two butters substitute each other at equal ratios. It will change the scent of the finished product, so be mindful of the essential oils you use. Not everything goes with chocolate. I am looking for a diy deodorant recipe that doesn’t darken my under arms and doesn’t leave my white shirts and other colored shirts dark in the underarm area. Any ideas? Me too! I have been using another brand name deodorant paste and it has made my bra all yucky under my arm area ? I have brought ingredients Heather has posted above but using a goat milk butter, hope it goes well. I don’t know if you ended up finding an answer elsewhere or not. Coconut oil can be the problem with the dark areas on your white shirts, and coloured ones as well. The recipe I use has about 1/3 coconut oil to 2/3 mango butter, arrowroot powder, a little cornstarch & a little baking soda. The mango butter & arrowroot seem to make a difference. I also try to give my deodorant a bit of a chance to set before I get dressed. The dusting with arrowroot powder would likely help you as well. I forgot to mention that I make mine solid with some grated beeswax & use an old deodorant tube. I know these blogs are all about “all-natural organic free-range” bla bla bla (And there’s nothing wrong with that! It’s great!) but Old Spice makes aluminum free deodorants. One is called Wolfthorn- and it smells like skittles!!!! If you’re willing to use something synthetic, I really recommend that. No, the poster said Aluminum free which means it’s just a deodorant—not an anti perspirant, which is, I’m sure, where you got your list of ingredients. Is this for a women as well or just men? the old spice ? Could baking powder be used instead of baking soda, is there a diffrence? Baking powder has aluminum unless you buy the specifically aluminum free one. Baking soda is a constituent of baking power, but they are different products. Like Wendy said, most baking powers have aluminum in them. You can buy baking powder without it, but you have to look for a product that states it doesn’t contain it. (Or does not have it listed in the ingredients.) There are other ingredients in baking powder which I’m not so sure would do well in a deodorant. You’d also have to add MUCH more of that to get the same amount of baking soda. Ingredients of baking powder are usually aluminum (in some form) unless it is aluminum free, monocalcium phosphate (& [possibly sodium acid phosphate), and usually cornstarch (tho some brands state non-GMO). Those may not be a problem in deodorants (other than the aluminum). ???? Trader Joe’s has aluminum-free baking powder, FYI, but not sure why you’d do that. They are different and are not able to be used interchangeably at all. For ex: you wouldn’t add baking powder to your laundry to help remove odors, only baking SODA can do that. Same thing for any DIY skincare like deodorant. I hope this helps!! 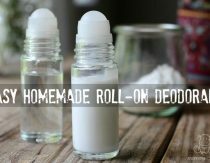 I’m definitely going to try make a homemade deo this weekend! Loved the article! I agree– Tom’s wasn’t cutting it for me either. I will have to try this new approach. Thanks for sharing ladies!? Hi! Can you eliminate the baking soda and only use arrowroot powder? Tia!! I love that you are doing this blog! I started a similar one after Dutch was born, but then life took over and I had to abandon it. :). So… You just slather this on with your hand? Does it cake or leave white marks? I love that it’s coconut oil, I will wear or eat just about anything with coconut in it. 🙂 gonna give it a try!! Lizzy, consistency is a big deal. We’ve made it too greasy a few times and too dry maybe once. So getting the proportions right is pretty important. If the proportions are right, it will be of a similar consistency to to most roll-on deodorants. I just take a swipe with my finger tip, like i would if I were getting the last bit of jelly from a jar. I use my index finger to apply it. We’ve probably used this recipe for 9 months to a year. I’ve had one experience when a dark shirt was stained by white marks. I’m not sure what happened on that particular instance. Either the consistency was wrong or I applied too much, I suppose. Daniel, thank you for the man’s insite. Can you tell me about how much coconut oil you use? I’ve made my own before, but it ended up too dry. I like lavender in mine and it works very well (when I can get it out of the container). I’d like to get my hubby off of regular deodorant. Becky, We do it by feel. More is typically needed in the winter months because cooler temperatures harden the oil. So if my deodorant has turned too hard would you recommend adding more coconut oil? It is winter time where I am right now and my man stink deodorant is a solid rock. Another great deodorant is sliced lime. I’m allergic to arrowroot but have been using lime for years and it works great. Just slice a sliver off and apply to arm pits. You could also use lemon but the line in my opinion works best for me. Lime is great, but never use it if you’re going to be in the sun as it will basically “cook” live tissue. I had first hand, doctor diagnosed, experience with it. It takes a while for the discoloration to go away. My underarms get pretty aweful. Ive been using a mixture of coconut peppermint and lavander oils on my underarm area, it does work better than store bought deodorant but doesn’t last me the whole day. I’m curious how long this recipe will block smells. If I can use it once in the morning and it will keep me from stinking all day I will love u forever. ??? I have used this recipe for about a year now. Nothing worked for me-I was desperate! This works. No more BO!! And it is super, super cheap. In fact, I am still using the original batch! the essential oil I used is tea tree, believing it would kill bacteria. Sometimes, my skin gets irritated for the first few minutes. I may try less next time, or try the one for sensitive skin. thanks for posting this! i’ve been meaning to ask you for the recipe! i’ve actually got 2 unused sticks of deodorant (aside from the 2 we’re currently using ) that i’m gonna take back for a refund! maybe that will pay for the coconut oil! question: how do i know if my cornstarch is GMO-free? and um, how do you apply it out of the jar? It will say GMO free on the container. We have to buy ours at Whole Foods. Sprouts might carry it, too. To apply, just use your fingertips and then wash your hands. thanks for reminding me…I need to make this! Also I would love a post on lunch ideas, with it just being Ava and I at home for lunch I need ideas. I don’t like spending lots of time making lunch but we don’t usually have lots of leftovers to use either. Any suggestions you have would be great! This works GREAT! Scott LOVES it and still smells like a pina colada even after a long day at work. I on the other hand, got terrible alkaline burns. I tried making it with just arrowroot and coconut oil and then discovered that I am allergic to coconut! Bummer! I guess I am doomed to stink forever. That’s awful. I know it’s not as antibacterial as coconut oil, but what about olive oil? I’ve never tried it but it would probably work. That could work! Since it tends to be pretty solid you might want to blend in a little olive oil so it rubs on smoothly, but cocoa butter sounds very soothing! Thanks so much for this recipe. I’ve been using it for a couple of years now and it works great. I like it better than store bought “natural” deodorants which gave me a rash. During the colder months (most of the year for me) I add a bit of olive oil like you mentioned above and that does make it very easy to spread. I just started adding lemon oil and between the smell of coconut and lemon, it smells so good it makes me want to eat it. Just thought I might add my two cents in here. You might want to just give up shaving your pits altogether (legs too!). I did about 20+ years ago and once in a blue moon I need to use deodorant to stave off odor. Before when I shaved regularly I had to use deodorant every day twice a day practically. And if you are worried sbout hubby’s thinking on not shaving…mine LOVES it! Now I save on deo and razors! And time! Hated shaving anyway! In my experience, this is very untrue. I’m from Flanders, Belgium and for women the norm is definitely cleanly shaven armpits. Women make strange faces at other women with unshaven armpits. As far as I can tell, this seems to be the same in France and probably other European countries as well. Perhaps the older generations (people now aged 60+) have less of a problem with it, but below: in general, no. oh i’m from Belgium to, it really that you have to shave everything as a woman, but i haven’t never had the problem that i never schaved my arms. I’ve had the opposite experience. I shave but between shaves I’ve found that the hair really holds odor, more than bare skin and is irritating/ouchy for me to bpot! I have become sensitive to baking soda in my deodorant. Could I just increase the arrowroot powder instead! Burning rash is no fun. I don’t shave but I do have a lot of b.o. since I do a lot of physical work so I definitely need deodorant, or so I’ve been told. I myself don’t care about the smell but apparently other people do. Stupid society… I’ll have to wait until next payday to make my own, but I’m very glad to have a solution! I thought the recipe she gave (in the article here) called for shea butter, not coconut oil? Coconut oil eventually stains clothing – believe me, I know this for a fact. I’ve started adding just plain Everclear to a small spray bottle along with clary sage essential oil, a few drops of patchouli, and just a couple drops of palma rosa essential oil. It has a yummy smell, is easy to make and apply, and nothing kills germs (which cause the “stink” in sweat) like grain alcohol. It can be a bit drying to the skin if too much is applied, so I spray about 3 shots into my hand and apply it to my underarm so I know how much I’m using. I never have to re-apply this throughout the day and I’m running from early morning until late afternoon (I provide day care). And, FYI, I would never use a roll-on applicator. Skin sheds constantly and that gets onto the roller and builds up bacteria. so i’ve been thinking about this today, and the quote about our skin being like a fishnet makes total sense! and it got me wondering: what is the best thing to use for other toiletries? like shampoo/conditioner, body/face wash, toothpaste, moisturizer/sunscreen, hand/dish soap, shaving cream, etc? oh and how much of this do you make at a time, and how long does it last? Hey Joanna, nice to see your face on here! We put our deodorant in a small caper jar and it last for months. You might start with 1/4 cup of baking soda and 1/4 cup of arrowroot to start out so you can play with the consistency. It’s hard to work with anything smaller from a measuring standpoint. Oh, on other products . . . good point! We have changed all the products in our house. There are a lot of options so that will have to be another post. Tracy, coconut oil is liquid at our house’s normal room temperature, so I don’t melt it. It would probably be a good idea though just to help it blend better. You’ll have to play with the ratio. Just start with a small amount and keep adding until all the dry ingredients form a ball. If it seems too oily at first don’t worry. The consistency will even out in about a week and lasts for a long time. One thing I found when I made it (did a variation with Shea Butter) was that it really didn’t want to solidify. It stayed liquid and the dry ingredients would settle after a while. I’d say avoid melting it, if possible, or only soften it enough to work with. I didn’t do this with the batch I made (still working through it, so haven’t made a second), so I put it in the fridge, which helped it set up without everything settling to the bottom. Once it solidified again, it stayed that way, though. Can you give a general idea on the portion of coconut oil you start with? Please tell me… what is the amount of coconut oil used in this recipe. I only see Shea butter listed not coconut oil, yet several of the comments refer to coconut oil in the recipe. I want to make this soon. Also the picture shows it looking like a cream , so hiw are people using it as a “roll-on” or do they mean a solid ,stick type which would make more sense. Can’t wait to try it. The stuff from lush doesn’t work for me! I love this recipe! Have been using it in hot and humid SC for about three months and it works great. I use the same recipe and love it. Unfortunately my husband says it makes his underarms burn. Maybe the coconut oil is detoxing all of the bad chemicals from his regular deodorant? It makes my underarms burn too, but it works really well other than that. I think it’s the baking soda for me. Too alkaline? I agree that baking soda will do the trick… And I live tx. I make a paste out of it w water… Ill have to try coconut oil!!! @Katie – Yay! So glad to hear it’s working for you! I tried some made with tis recipe and unfortunately got painful burns on my underarms. 🙁 It worked great other than that though. @Anna-Marie – I’m so sorry! Been doing some research on this and I think the problem is the deodorant is too alkaline for some people. I would try reducing the amount of baking soda and increasing the arrowroot. That solution worked for me! I use a teaspoon of baking soda and I use essential oils. Love the results! Since you posted almost 2 years ago, you probably won’t see this. But ,,, I was wondering which EOs you used, and if yours were only for scent, or ones with anti-bacterial properties that helped with the odor? I love this Heather! I have been using a crystal deodorant for years but I find if I drop them they crack and break and before I know it I am throwing them out when I know they are supposed to last a long time. I will definitely try this! For all of the people too sensitive to the baking soda, many people do well with straight coconut oil! Great suggestion, 20 Something! Thanks! Okay, this stuff is AMAZING! I’m officially hooked;) Thanks for sharing it! i think we are going to try this! Hi, I’m so eager to try this! My husband on the other hand is a little more reluctant. I did have one question, do you know if arrowroot is safe to use during pregnancy? Thanks! Ok, I just had to come back and tell you how impressed I am with this. I actually made it a few weeks ago but didn’t dare try it at work and I forgot all about it. Today I did a test run. It’s 27oC outside which is about as hot as it gets in England. I drove an hour in my little unairconditioned Peugeot, then lugged a big trolley around Ikea for an hour, then drove the hour home. I smell lovely! Like shower gel, the one I used this morning I guess. Not only that, I am surprisingly dry. I didn’t realise until today how sticky normal deodorants make me. Thank you so much! I am going to attack my boyfriend with it when he gets home! Yay! I love to get comments like this, Charlotte! Thank you for letting me know! I just popped back to check the recipe for my next batch and saw your reply. I used this stuff in Texas during the drought / heat wave at the end of August (visiting family). No stink. And… I feel like I dealt with the heat better. I know it sounds odd, but I actually found it strangely satisfying to sweat, I felt perfectly comfortable on the occasions when my underarms were wet because I knew I still smelled nice and I really did feel the cooling benefits of getting a bit sweaty! I used up an old can of deodorant recently because I’d run out of bicarb and I hated it. That stuff smells SO strong and it feels really synthetic. I am DEFINITELY going to try this! I’ve been trying to find the perfect natural deodorant for my husband for years and recently read about trying coconut oil, but your recipe sounds like the perfect combination! You probably know about this already but just in case, to get oil stains out of clothing just dab dish washing liquid on it and toss it in the washer. I just learned about this and clearly the excitement of resurrecting clothes from cooking battles have not yet worn off. For some reason I never seem to remember to change my clothes when cooking. ok so this recipe was great for a while but since the end of summer (i guess due to our house being a few degrees colder) the consistency is so hard that i can’t get it out of the jar unless i scrape it with my finger and then of course it’s not going to go on smoothly. tips? my coconut oil isn’t liquid anymore (again, house temp changes everything grrr!) so i don’t know if i just need to make a fresh batch each season or what. I add more coconut oil this time of year to make it more spreadable. The air is drying so my skin doesn’t mind the extra moisture. I have the same problem — we heat with wood and our master bath is COLD. I just dug out the packed mixture so it was crumbly and I could grab pieces to warm with my fingers. I keep it stored in a shallow half-pint canning jar with lid. I put some in my palm and rub it with two fingers for about 5 sec and it is so easy to apply. Then I just rinse off the rest. I added some purification essential oil and it’s perfect, even for the gym. Amazed!! Me and my hubby have been using this for almost a year and love it! Thanks so much for sharing! I’m so glad ya’ll like it! Even though we’ve been using it for years now I’m still amazed that something so simple could work so well! Convinced my hubby to try it and it works just fine! He works out hard 5 days a week and works in a hot warehouse on the weekends…he smells just fine! I am going to makethis in the am!! Hubby finds the natural aluminum stuff we buy dfoesnt work all day. My husband and I LOVE this deodorant recipe! 🙂 We’ve been using it for about a month now and it works great! 🙂 Thanks! I added tea tree oil to mine for an antibacterial boost. I love it, but it broke me out in a rash. I’m trying it with just arrowroot now, and its not quite as powerful. Oh well, it still works! 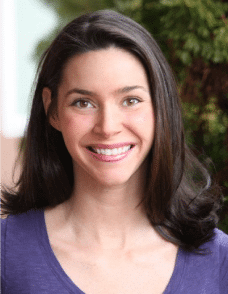 Erica Gorham – Sounds like the PH of the baking soda might be too alkaline for you. Straight arrowroot is a good way to go and I’m glad it working for you! I’ll try using just arrowroot. Would I sub the baking soda for arrowroot 1:1? Awesome! I’ll try it with the citric acid. The straight arrowroot is keeping me dry, but there is a slight odor, and I didn’t have that with the baking soda in there. Thanks Heather! OMG this is awesome. I was having issues with the baking soda making me break out. I switched to 1 to 3 ratio with the arrowroot. Used teatree &joy essential oils. Da BOMB! I was thinking to try add Citric Acid, does it dissolve well in oil ? Citric acid is water soluble so it won’t dissolve. I suppose it could be very finely ground and mixed in with the hope that it would evenly distributed but I think it’s likely to clump and potentially cause irritation. I LOVE my homemade deoderant! It’s my favorite thing. I’ve been having a reaction to it 🙁 I’ve been using it but I get red irritated bumps right away…. hoping this changes. Can’t wait to try this, hubby is willing 🙂 I was wondering how do you know the baking soda is aluminum free? Will it always say so on the box/should I assume it has aluminum if it doesn’t say it doesn’t have it? I checked my boxes and they just say sodium bicarbonate….. Arm & Hammer Baking Soda is aluminum free. Thanks for saying something about the corridor acid. This is the second homemade deodorant I’ve used that has made me break out in a rash, and I couldn’t figure out why. I am not sensitive to any of the ingredients when used in other skincare products. It’s been killing me! I’ll try the citric acid! Roxanna Farnsworth – Hmmm, that could be a ph issue (like Erica Gorham and I were talking about), but I’m curious if you have been checked for a sensitivity to coconut oil. Just a thought . . . I love this stuff, only natural deodorant that actually works for me!!! no I haven’t… but I have been consuming coconut oil and using it on my skin with great results, so that would seriously bum me out! I’m thinking ph issue because I’ve always been a heavy perspirerer (LOL) but it was getting better with GAPS and lots of extra magnesium… then I had my 2nd baby 8 weeks ago and everything is all over the place again (thank you hormones). for Roxanna, I had that problem a couple of times, so I changed things up, I found I had the most problems when I would put my homemade deodorant on right after a bath/shower, I think it was my pores being open right after a bath/shower, so I started showering/bathing at night, applied just straight coconut oil, then put the deodorant on in the morning. I don’t have breakouts or irritations anymore. Ahhhh, Roxanna Farnsworth, that makes sense! CONGRATULATIONS on the birth of your baby! I think a ph issue is more likely, though. Syreeta Whitfield Jayne’s tip is worth a try, don’t you think? Just an FYI: Adding tea tree oil made our armpits itch like crazy!!!!! I have been using this tweaked version of deodorant for a little over month and a half and I am so thrilled that my armpits no longer stink! LOL. And I don’t have to re-apply once I’ve done it once during the day! The absolute best part is that it’s safe and natural. Honestly, no other deodorant has been able to completely and fully eliminate the stink as well as this recipe has. I added beeswax and melted everything together, added some tea tree oil and a bit of peppermint for the cooling effect and poured into an empty deodorant stick tube. Thanks again for a great article! I shared it on my Coach Hedman FB page! I have found success with Arm and Hammer’s deodorant (hard to find but I can get it at Publix) but still wonder if there is harmful ingredients in it. There is another one I found called Crystal Body Deodorant. I haven’t used it yet but all it has in it is; purified water, natural mineral salts (potassium alum) and cellulose. We have been using crystal deodorant but I have learned that alum is short for aluminum! Now I am wondering if it is really safe to use. This is seriously wonderful. My dad was buying a locally made deodorant at an organic store that was selling for $10.99 a tube and had nearly identical ingredients. I’m so happy I found this recipe – it’s such a money saver! I picked 20 lbs of blueberries in 85F sun and sweated like crazy, but I had no odor at all. I put it to the test once again today with an intense workout and again – no smell. Even my regular old (with aluminum) deodorant wouldn’t have made it through those tests. I was afraid I’d be sensitive to the baking soda, so I used 1 part baking soda and 2 parts cornstarch and it’s great. Thank you so much! That is so awesome, Sarah! Thank you for taking the time to let me know! Is this deodorant recipe the same one in your new ebook? I would like to try your arm deodorant recipe but i am not sure how much of each ingredient to use, if you could give me the amounts of each to use i would really appreciate it. Does it prevent perspiration at all or just take away smell? I’m curious to try this, but I’m wary, because my sweating problem is so bad that I’m worried I’ll just sweat off the natural deodorant. It doesn’t prevent it but it does absorb some of it, and it definitely takes away smell! update: I gave this a good effort, tried it for a week. I stopped because I still smelled really terrible and sweated like crazy. Might just be me…I have a very real sweating problem. But this might be good to know for someone with major sweating issues like me. Wow, this is the first time I’ve heard it didn’t work for someone. Thanks for the feedback! Ok so first of all, I first made this months ago, and it works GREAT! Unlike most “natural” deodorants it really WORKS!! I never expected it to actually work on my hubby, but it definitely does! I like it too, but after I use it for a few days I have to stop because my armpits get extremely irritated? So then I just switch to straight coconut oil. I’ve been making it with the organic cornstarch I have…do you think it’s that or the baking soda that’s causing the irritation? Yes, it might be the baking soda. Skin has a slightly acidic pH, and baking soda is alkaline. Depending on your unique chemistry you may need to lower the pH a bit to make it match your skin better. To do this, just increase the ratio of cornstarch to baking soda. I’m confused why you mention aluminium-free baking soda. I thought baking powder had to be aluminium-free, but that there is no aluminium in baking soda. Is there anything non-oily that can be used instead of the coconut oil? Even rubbing the tiniest bit of coconut oil under my arms leaves oily stains on my shirts. Just heard your talk on the village green network. So much great info, thanks! Am excited to give this a try but am wondering, for those of us that are candida challenged, are there any tweaks you might suggest? Like arrowroot vs. cornstarch, might one be better in this instance? How about essential oils? If it were me, I’d avoid cornstarch in situation where yeast overgrowth is an issue. Re: essential oils: I am not aware of any essential oil on my suggestion list that are contraindiacted for candida. That’s not to say one isn’t, though. You might want to check with an essential oil expert on that! This is perfect. I’m definitely sharing. I also love the quote you included: “Our body is less of a suit of armor and more of a fishnet.” True, true. Is the coconut oil raw or expeller pressed or does it even matter? Gonna try this real soon!!! Hey Julie! If I may, how you ultimately want the deodorant to smell depends on what type of coconut oil you use. I used extra virgin in the first few batches and it worked great but my husband complained it was too “oatmeal cookie” for him. I decided to try refined, expeller-pressed oil that we use for neutral-flavored cooking, and voila! No more oatmeal cookie, just beautiful essential oil aroma! I’ve been using a similar recipe for about a year now. I would warn that if it melts it sort of separates and needs to be mixed up again. I’ve had that happen and you get some really dry parts and some really oily part in the same container. The same thing has happened with my homemade toothpaste. I actually bought one of those coffee cup warmer trays for about $10 that I some times use to warm up my creations for better application. Like Samantha, (March 23, 2013 post), I am confused about “aluminum free” baking soda. I went to Whole Foods in search of it and was told by an employee that only baking powder can be aluminum free because there is no aluminum in baking soda. I also looked up Bob’s Red Mill baking soda and powder, and found same result: they offer aluminum free baking powder but not soda. Have you actually found a product that is labeled aluminum free baking soda? Or is it baking powder you are using? I so so so wish this worked for me. We’ve cleaned up so much of our home, but natural deodorants just don’t work for me. I tried multiple kinds, made multiple versions, and I simply sweat too much. Gross. thank you so much for this recipe! it really does work! one question though…if anyone can help with this…i used to have some discoloring on my underarm skin when i used conventional deoderant but when i switched to Tom’s natural deoderant it went away…however now that i’m using this recipe it has returned…any ideas on why??? thanks ! I have a deodorant stick recipe in my ebook, DIY Organic Beauty Recipes, but my husband prefers this one because he finds it is easier to apply. Go figure! aha! too alkaline for the body. that’s why my underarms went nuts about 3 weeks into using my deodorant, huh? I went back to my “crystal” (which requires several touch-ups throughout the day) but I will try less BS and see if it helps 🙂 Thanks! I’m with Andrea on that! Rashorama! Works for my friends. It’s the abrasive effect of the bi-carb, not so much the alkali. If you want it in a stick just add a little cocoa butter to it. It hardens but gives it a nice glide too. Either that or Shea. The coconut oil isn’t the essential part so you can play around with the oil/fat part of the recipe. Oh! P.s. To clear up any reactions, marshmallow extract (reduces inflammation) and pomegranate (regenerative) extract work a treat. I tried this for a while and it just didn’t work well. It ended up being too messy than what it was worth. I’ve instead started using magnesium (like Phillips type…for constipation). It works awesome. Dries quick, stays “dry” (obviously unless you sweat), and excellent odor protection. Yes! I use kroger brand plain milk of magnesia and add about 10-12 drops of tea tree oil to a whole bottle. I store in a plastic squirt bottle. I squeeze about a nickel size amount on my finger tips and press my other fingers onto it and apply to pits. Can blow dry but usually dries fast while dressing. I’ve used this for 7+ years and I don’t stink. Even the next morning most of the time! So cheap, so easy, so reliable! I’ve read through ALL the comments, but haven’t seen this mentioned yet. My husband and I are big fans of this deodorant and have been using it for months. However, we both experience breakouts around the area where we apply the deodorant. Sometimes little, sometimes large and deep, none have seemed to turn into cysts yet, but they can sometimes be painful. Any ideas on this? Does it have to do with the alkalinity of the baking soda? Do you think adding citric acid would help? Thanks! Heather!! I did NOT believe this could be possible but I put your deodorant through 3 tests in the disgusting Texas heat and WOW!! I just linked to your post on my blog. Thanks so much!! I really like this recipe and I want to try it but my hubby doesn’t like sticking his hand in a jar to pick out the deodorant. So I was wondering could I put it in an unused deodorant tube I have? 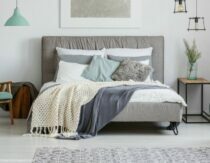 Thank you for your wonderful blog….I am in love!! You can give it a try! 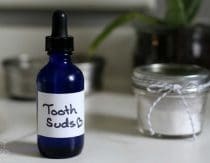 I actually have some recipe for stick deodorants in my book, DIY Organic Beauty Recipes, but my husband prefers this one because he says it goes on easier. Go figure! I was so excited to find this today that within minutes I made a small batch (1 Tbsp Baking Soda to 1 Tbsp Arrowroot powder) and immediately tried it. Within minutes my armpits were burning! Needless to say I washed it off quickly. I tried adding 1 more Tbsp of arrowroot powder and tried again but I am still experiencing burning (though not nearly as bad). Should I add “more” arrowroot powder or will that make it not effective? I have tried a variety of organic deodorants and had the same burning problem, so I am excited to learn that it must be the baking soda (high ph) in them that causes it but now I am back to square one. However, one last thing comes to mind that I also recently learned and that there is metal in the baking soda and you can actually by a metal-free version. I wonder if that would help? Any help would be such a blessing!!!! Hi Kimberly! Some believe that baking soda contains trace amounts of aluminum, but after researching it pretty extensively I personally do not think it does. It does sound like your skin might be having a reaction to the pH of the baking soda. You might consider substituting bentonite clay instead for a more gentle deodorant. It works reasonably well. Not as well as baking soda, I’d say, but the extra deodorizing power of baking soda is not worth burning armpits! I don’t recommend this deodorant. First of all it burned so I added Vitamin C and it was fine. What really annoyed me is later is I realized my T-shirts in the arm pit area were looking soiled from the coconut oil and orange from the Vitamin C. Many of my T-shirts are ruined now. As a person who’s low income due to being on disability for a chronic illness this is a hard pill to swallow since I have to go out and buy all new T-shirts which I can’t really afford. The reason I was looking for a recipe is I found the salt rock not strong enough in the summer. I’ll go back to using it in the fall/winter/spring and buy a natural deodorant for the summer. It’s a fantastic product, and lasts an entire week! I love the product. Gracie, I’m gonna give Lavilin a shot! Been hearing great things about this brand for a while now and I figured it’s time! I find that spraying (or swiping) my underarms with a mixture of bragg’s apple cider vinegar and water (same mixture I use as a toner!) after I shower balances the PH of my underarms and prevents the irritation that can occur with baking soda (same reason I use the ACV/water toner after a baking soda facial!). It also seems to make the deodorant even *more* effective (perhaps by prepping the skin for application? I’m not sure on this one…). I’ve tried lavillin and some other natural options, but none of them are as good as the homemade stuff! Hi, I tried this and it was wonderfully for two weeks and then I broke out like crazy! Painful lumps in both armpits. I had to stop using it. I then tried another homemade recipe without the baking soda which did not work at all. I also bought a good quality deodorant from a health food store, which was very expensive and utterly ineffective. So so disappointing. I finally had to get another tube of the toxic kind because I cannot stink like that day in and day out. All that to say…is there an effective alternative to the baking soda? Hi Nylark! If it were me I would first try reducing the ratio of baking soda to arrowroot as described in the post. If that doesn’t work you might consider replacing the baking soda with bentonite clay. I don’t think it’s quite as effective, but it’s far more effective than most “natural” brands! This deodorant really works. Even after a full day that ended with a sweaty workout, I have no smell. Great stuff. Thanks for sharing. Sounds great! I really want to make some….BUT…one question, so I don’t waste ingredients. Do you smell like coconut??? I can’t find a homemade deodorant with out coconut oil…..my husband HATES coconut, even the hint of it in food and he won’t touch it….I don’t want to meet the same fate as the food, but I want to make my own natural (GAPS friendly) fragrance free products. Homemade deodorant is a great way to get started with DIY personal care products. It’s super-easy to do, and it works great. Once you see the success with deodorant, it will spur you on to tougher projects like DIY soap and shampoo. Hi Adrienne, you might try bentonite clay instead of the baking soda. We’ve started using wheat starch for our cooking. Would this work in place of the arrowroot/cornstarch? I haven’t worked with wheat starch so I can’t say for sure, but my guess is that it would probably work. I have used this recipe and it TOTALLY works just as well as Lady Speedstick or Rexona! Wow… I have never heard of BLACK armpits?! I used cornstarch instead of arrowroot powder in mine and no black bits at all… you could try that? I stopped wearing any kind of deodorant years ago, after a brief adjustment period, I find I no longer need it. Love my Primal Pit Paste! I’ve been using Milk of Magnesium as a deodorant for about a year and it works beautifully! My husband uses it, too! I’ve been using store brand non flavored milk of magnesia for a year now and it works great. I store in a squeeze bottle and pour about a dime size amount on and rub on. It works ALL day. It’s cheap too. I use a similar recipe but add beeswax. Makes an awesome stick and won’t melt in the summer. I also add just a little bentonite clay, helps absorb moisture. Primal Pit works great for me. Also I know Root Beauty makes a great one! I have been noticing irritation but only under one arm, so my next batch I will decrease the baking soda as you suggest! but I have been using almost exactly this recipe for months now and love it! Exactly what I use, and hubby too. Funny I was just looking at this Lindsay Slate 🙂 thanks!! My husband and i both use lemon or lime juice, works great! I went to a whole food store to get these exact ingredients over the weekend. I found an all natural deodorant called Nourish Organic that I bought instead. So far so good! Henna, Some people have reported that it has, but Heather has been using it for years and has not experienced that. Since the amount of coconut oil is based on preference, some may use more than others. Also, it might depend on how snugly clothing fits under the arm. I don’t have any problems with the homemade deoderant. Mine has coconut oil in it. My husband on the other hand…..his clothes look awful. I make this and it’s never stained our clothes. It works AMAZING. Never have I tried anything that works as well, even the store bought clinical strength stuff! I also use Milk of Magnesia for the past year. Works great! Doesn’t Tom’s make one that’s suppose to be great? Do you have any suggestions? Since I’ve been pregnant that recipe and many natural companies do not work for me. Should I just increase the baking soda? Thanks! This recipe WORKS! I made some and had the whole family try it (brother mother husband ect) everyone loved it! I found it worked better than commercial. Deodorant and all natural! Yay happy dance. My hubby and I have been using your deodorant recipe for years now and we LOVE it! It works great for both of us! Stephanie, It’s there to buffer potential irritation from the baking soda. If it’s working for you using cornstarch or nothing at all, I don’t see why you would necessarily need to add it. I use this and it works great!!! I have been doing this the past year and it worked, but now that it is really hot, it has not held up when wearing sleeveless shirts. Was skeptical but I made it and LOVE it! I’ve been using coconut oil with a little baking soda per a friends suggestion. I do plenty of sweating and it seems to work like a charm! Sheila, Yes! Heather has found that it keep her very dry. That’s what I use, love it- works perfect! we just use plain baking soda and it works great! There’s a deodorant stone. Lasts forever. Very natural. Don’t buy the deodorant causes cancer alone or that not sweating from antiperspirants keeps toxins inside. This is definitely the best recipe. I’m hooked for life. Great recipe! We add a few opened capsules of probiotic to it! Works wonders. Correlation does NOT equal causation. Deodorant does not cause breast cancer. Please stop promoting this myth. Even the Cancer Institute, who would love to find a cause, refutes this. Use natural all you like, but regular does not cause it. Not deodorant, ANTIPERSPIRANT. Keeps you from sweating, aka, keeps toxins inside body. Clarinda Ann Marlar Maddox Yes correlation is not the same thing as causation but all scientific studies are based on the principles of theories. Everything we think we know is not exactly fully proven. So we can’t rely on what the Cancer Institute or anyone else says. We can make our own conclusions based on different theories and findings. Maybe someday we will have better ways to study such correlations. Better safe than sorry!! Koa Wainman let’s make some ! My sister Kim Kim Kupfer made this for me and I love it!!!!!!! Michelle Weaver, this is one of the articles I was talking about. The 2012 study. Allison Harvey (can’t tag,) or anyone else that knows) what’s the added benefit of using probiotics in this recipe? Thank you for sharing this article again. I had been using one of those crystal deodorant stones, and this article explains why I was having so much breast tenderness and pain after using the stone for a few weeks. I’d like to switch to this recipe, but also detox my tissues! Have you experimented with using bentonite clay in this recipe? I have all the ingredients anyway, just curious! Thanks again! Violet, I have not, but it would probably work well. 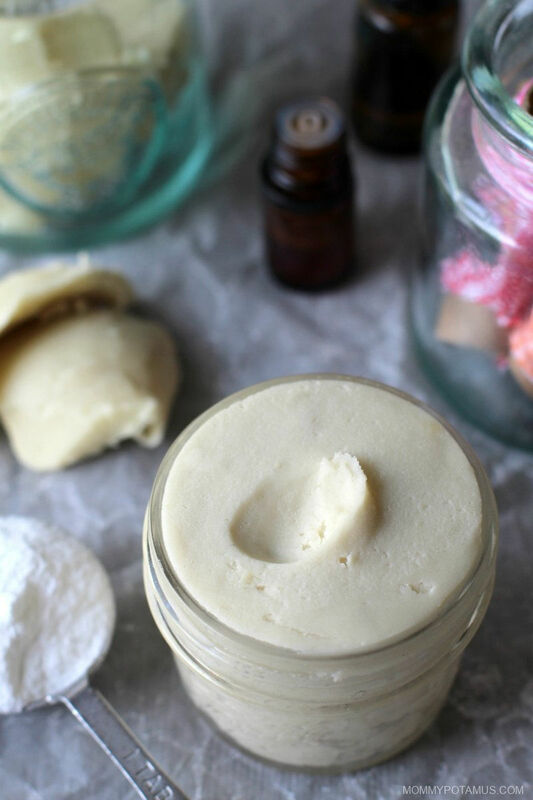 I use clay in one of the deodorant stick recipes included in DIY Organic Beauty Recipes(https://www.mommypotamus.com/lp/order-diy-beauty-ebook/). I tried this before and it didn’t work for me but then; neither does the commercial stuff. I sometimes get a whiff of my “man stink” and think – this is not fair…I’m a woman! I will try it again but will add a few capsules of probiotic as a reader commented. I’ve also heard about the use lemon and lime, but never milk of magnesium. I think I will try them all. Why should I keep using the commercial stuff and risk my health? Thx all! Been making this for 2 years now – highly recommend using arrowroot powder instead of baking soda – the baking soda gave me a horrible painful rash. And recommend not using right after shaving. Husband, daughter and I use it ALL the time. I understand arrowroot is on the GAPS “avoid” list, but a lot of homemade deodorants call for it to absorb moisture. Do you know if it is okay to use in deodorant or because it’s a starch and it will feed the microbes in the armpit and could be absorbed into the body, it should still be avoided in deodorant recipes while on GAPS? Thank you. I recently found white cosmetic clay on the Mountain Rose Herbs website that specifically states it has absorbency properties that are good for deodorant, so I will use that instead of arrowroot. Just wanted to let anyone else know who may have had the same question. I just created this concoction without the coconut oil! Works like a champ! My deodorant was making me nauseous! The combination of sweaty armpits and deodorant was just unbearable! I had to find a quick alternative and mixed baking soda, cornstarch and peppermint oil! Love it!!! Thank you!! I was able to smear it on, let it dry and dust the powder residue off so it wouldn’t get all over my shirt! So cool!! And SO cheap!! This article is 4 years old! I read all the comments and wanted to add my 2 cents, too. When my husband and I started making changes to our home and diet, we needed the ‘going cold turkey’ method or we would never change! We did that with our deodorant last month. Let me tell you….armpit detox is real! We were using a Tropical Traditions deodorant that we made the switch to….and it just didn’t work. So, we just didn’t wear deodorant. We just didn’t. It was bad…awful…no good. And we have VERY public, active jobs. Did I mention it was bad? Any way, I noticed I only smelled in one armpit, so I suspected detox. All the skin in my armpits also started shedding, so I rubbed it all off. Not painful. Then about 2 weeks later, we didn’t smell any more..or atleast only a little on active days. Now our tropical traditions deodorant works, and this recipe works BEST of all, keeping us dry! Whew. All that to say, we needed to just be patient, wait out the smelling bad…then it was awesome. Do you mean a detox from deodorant or were you doing a full body detox as well?? thanks! I’m wondering, will it work to put this in a stick or does the composition of it make it best to put in a jar and apply with fingers? We’re going to give this recipe a go. We tried the bentonite clay deodorant recipe from your book, and it works for about 3-4 hours and then needs re-application. We must need something a bit stronger along with some magnesium;) Are the 20 drops of EO you suggested still OK to add? And, are there specific ones that are on the safe list for nursing/pregnant women? First off, thank you for doing the research and trials to get this right. I have tried a few deodorants from the Natural Health stores and also a DIY deodorant sold at a local wellness shop. None of them worked, and sadly the one from the wellness shop gave me an extremely painful rash. I used 3/4 cup or arrowroot powder and the rest baking soda, just in case I was sensitive to it. What can I say, day two and I have no rash and I don’t stink! I am wondering, where can one buy those empty deodorant tubes. My son is only 10 and doesn’t currently need deodorant yet, but I am sure the day will come rather soon. I would love to make some and put it in a deodorant tube/container for him when he needs it. Hi Heather! I have recently started making changes in my life, trying to live a more natural, chemical free life and my aluminium loaded deodorant is the next thing I would like to get rid of. I live in a fairly warm country and the coconut oil stays liquid. Do you think this would work as a roll on deodorant? I have the bottle from my old Nivea roll on (its got the ball) and would like to use this bottle. Do you think it will work or should I increase the oil I’m using to get it more liquidy? I’m also sensitive to baking soda and so I was thinking of using 1/4 cup baking soda and 3/4 cup arrowroot. Do you think this will work? You could use half shea butter and half coconut oil to help it stay more solid. I’m going try this recipe! Thank you 🙂 I can add essential oils for a nice smell too right? How many drops do you think I would need? Will this look sort of glossy when it sits in the container? It isn’t oily really but looks glossy as though there’s a ton of oil in there. Or is this just the arrowroot? I made this, Can anyone tell me why it is causing severe burning after applying it? It’s so bad and leaves them feeling really sore! Hi Victoria, it sounds like the baking soda is too alkaline for your skin. Everyone’s pH is different and some people just don’t react well to baking soda. I would take a break from it and then – if you want – consider reintroducing with less baking soda in the formula. I would be interested in making my own deodorant but only if it was fragrance free. I have no desire to smell like a flower and I don’t think most men would either. The smell of patchouli is so strong and awful that it burns my sinuses, and frankly sweat smells better. When you find a way to make it smell like pumpkin pie or warm cinnamon rolls I’d be right there. You could try experimenting with essential oils scents like clove, cinnamon,allspice (if they have it), etc. These spices are used in pumpkin pie filling and it won’t hut to play around with them. In the recipe for the deodorant it does not have how much coconut oil to use. So how much coconut oil should we use? This is the first deodorant I’ve tried that actually works. And so easy to make. Thanks so much!! I understand the odor free, but does it do anything to help with sweating? We live in a very humid area and need something that helps with sweating as well as odor. How long does the deodorant keep? I made an extra batch about three months ago. Stored in cool, dark place, but wasn’t sure if it’s still good to use. I used to make this all the time until I developed a horrible rash from the baking soda. Has anyone tried this without the baking soda and still found it effective? I am so sad because it worked so well but I can’t use it anymore. How much coconut oil? I see no designation in the above recipie. enough to make it moist – i made it a bit pasty, will see…. being a great experimenter i substituted: one Tbs of potato starch and one Tbs of tapioca with 2 Tbs of baking soda (took about 3 Tbs of coconut oil to have it all moist and pasty) Then i got a bit too much tea tree oil in (you know, first it did not drop at all and then i had it running….) I am VERY excited to see how hubby likes it!!! reporting total success! Best of all: he likes it and he does not smell gross any more like he did with commercial deodorant and sweat! this is an entirely different matter but i hope you can help. we have two dogs and they stay indoors. problem is they have ticks and fleas. we have tried the commercial products for anti-ticks and fleas and we give them a bath at least one a week but the ticks continue to breed. we have also tried to remove the ticks manually. still, i cannot keep up with their breeding speed. i will appreciate any suggestion/s. Would there be a benefit in using Castor Oil in the deodorant because of the benefit for the lymph system?It is reported to be antibacterial/fungal etc so should be positive in that respect. Appreciate your approach to a whole lot of things I have read on your site. Some of the things have made a big difference in our house. Thanks a lot. I wanted to tell you that I’ve used this deodorant recipe for a couple of years now and it really really works. However, all of my clothes are stained in the armpit area. Hubby decided he won’t use it for that reason. I use home-made detergent using as a base, soap which I make using tallow. Any suggestions to remedy this would be dearly appreciated!! How much coconut oil in the dry ingredients? I like to be exact. I have been using coconut oil-bicarb type deodorant for 2 years now and find it works really well for myself and my kids. I do struggle with keeping the clothes clean as each shirt needs to be sprayed (vinegar-bicarb etc) then each armpit needs to be individually rubbed to get it clean and then in quite warm water too. Please could you recommend suggestions to combat this or another safe deodorant that does not leave these marks. I find this as well. I’ve got my recipe down pat (the right balance of coconut oil, sodium bicarbonate, arrowroot and my essential oils), and find that it works great but leaves my clothes with yellow marks (over time). If I could fix this yellowing problem the deodorant would be perfect! I have made this deodorant for myself and love it! My husband said he would convert to it if it could help with the amount of sweat he deals with everyday… Is the excess sweat just a result of detoxification that he would have to deal with for a while? I’m not crazy about him using an antiperspirant because sweating is a natural and healthy function of the body, but I don’t want him to come home from his desk job with drenched shirt sleeves! So is the excess sweating temporary or can something else be done? So if you’re concerned about sweat, increase the amount of Arrowroot or Cornstarch in the recipe. I’ll admit, I was a stinky dude come Sunday’s at the gym. With this recipe, it lasts at least a minimum of 24 hours (or more) and I wouldn’t smell a bit! So ensure your husband that it’ll work for him, if he isn’t already using it at this point. 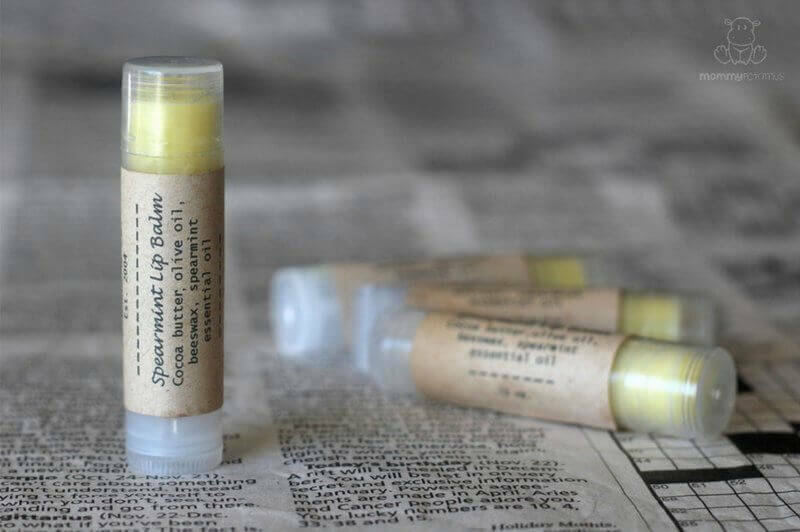 I made this wonderful deodorant and just love it! Thank you so much for sharing. I have shared it with friends. Mine turned out a bit crumbly, I still use it every morn, but I would like to have it a bit more pliable. Could I, at this point, (1 month after making) still warm it up and add more coconut oil? Will this change anything besides the texture? Yes, you can definitely add more coconut oil. So glad you like the recipe! I have tried homemade deodorants before and the only problem I found was that the oil stains my clothing, has anyone else experienced this? If so, how do you handle it? Hey there, thank you for this super simple recipe, i really appreciate your great work, keep it going! This deodorant version seems to work great for me, i do though wonder about the consistency, because when i rub it on my skin, the baking powder feels like a mild exfoliator, it does not dissolve, and after the oil soaked into the skin, it kind of falls off, because it is dry powder again. Is it supposed to be like that, or am i doing something wrong? I LOVE THIS STUFF! I SWEAR BY IT! I very recently made my first batch of your deodorant down in Florida while we were there on vacation…a small batch (1/8 cup each of baking soda and arrowroot powder and 1 tablespoon virgin coconut oil that I first softened in the sun out on the patio–a window sill should work too). We were ready to leave on an outing, and oops!–I detected underarm odor. (AS A SIDE NOTE, mine appears to be hormonal in nature. I can shower and an hour later, I smell.) Anyway, there was no time to undress, wash the “pits,” dry them off, apply the deodorant, and then re-dress, so I simply lifted up my blouse, held my fingertip in the jar of deodorant long enough to let some melt (sort of) ON my fingertip and proceeded to apply a small amount to each underarm. Voila! Within seconds, odor ALL GONE. Lasted ALL DAY. Thinking it was just a fluke, I repeated the technique the very next time there was an offensive odor emanating from my underarms. Worked AGAIN and LASTED ALL DAY. This ranks (in my book) as a literal modern-day MIRACLE. One of the friends I shared this with told me that her daughter would experience underarm odor whenever she was pregnant; suggesting that her odor may have likely been hormonal also. I started using this recipe about 1 month ago and I can say it was a bit odd getting used to the feeling of coconut oil in my armpits. With that out of the way, I love this recipe! It works wonders for me and lasts through the entire day (as opposed to the commercial brands). Just a bit about myself, I’m a 35 y/o male that frequents the gym three times a week. The worst day for me were Sundays doing 45 mins of resistance training and 30 mins of cardio. By the end of my cardio, I would stick to the high heavens if I had forgotten to apply fresh deodorant beforehand. So I decided to test out this recipe with my Sunday routine. I was shocked to see that this recipe worked wonders for me. I had not applied any fresh deodorant since the day before (after my shower) and just went to the gym as usual. My mother also joins me and she could confirm that I wasn’t reeking as I had in the past. Thank you so much for the recipe and I look forward to trying out your other ones. Especially getting away from big companies that are ruining our health! Looks like a recipe worth a try, the stuff in shop bought deodorants and the effects of some ingredients can be such you would wonder how anyone can by them… male or female. I am excited to try this as soon as I can get my hands on the ingredients. Normally I use just a little milk of magnesia, but I’m pregnant and my body chemistry changes when I’m with child and *nothing* seems to work (which is awesome when I also have pregnancy- induced extra-powerful sense of smell). I have high hopes for this, though! Hi, thanks for the recipe. I just have a questions about staining. As my husband sweats will it stain or rub off on his clothing? We have tried a natural beeswax deodorant and now all his white undershirts and dress shirts are yellow under the arms. Just wondering if this will leave any greasy stain or residue on his shirts. Thanks you for this recipe and this amazing blog! I have a quastion. Do you think it is ok to substitute the arrowroot powder by manioc starch? I don’t really like using corn derivatives and since I live in Brazil manioc starch is super inexpensive. Oh, now I see a bunch of typos in my text, sorry! Is there a spray on alternative? I have a severely mentally challenged daughter that becomes a giggling mess when I try doing anything hands-on with her pits…lol We currently use the bad stuff (Degree spray) but when the weather is hot,it doesn’t even last half an hour. I read many years ago in a ladies’ magazine article about Princess Diana that she used vinegar as a deodorant. I thought that if it worked for her, it must work for me. It does! I use raw apple cider vinegar in a spray bottle and I love it. Hi, can’t wait to try this! do you think i can sub bentonite clay for the arrowroot powder (just cuz that’s what i have on hand)? I keep noticing mention of coconut oil use in this recipe, but there is no coconut oil in the ingredient list or instructions. Am I missing something? Hey Erika, I originally used coconut oil as the base for this recipe, but I changed it because some people have trouble with coconut oil and shea butter absorbs better. I made your deodorant with coconut oil and now I see it changed to shea butter. I only did one batch and it was too hard when cold and got a bit of coconut oil (liquid) when hot. I did not get the right proportions yet I guess. But also I see that the old version used the same amounts of each and now it is not even: less baking soda (3) to (5) arrowroot or cornstarch. Is there a reason for that? Can you tell me what difference you noticed between the 2 versions, or explain a bit better what you mean by “shea butter absorbs better”? By the way, I love it!!! and so do a couple of friends that I gave some to try. One said it was the best deodorant he ever used in his whole life! The only down side so far is that it stained a white cotton shirt that I sweated in and got kind of yellow. I would really appreciate if you answered me because I need to make more soon! Thank you! Just wanted to ask a question: My underarms dark brown after I switched to natural deodorant (I switched back in March). I don’t think this is still “detox”. I had about 2 weeks of mildly irritated pits at the start, but nothing afterwards. I love my natural deo and the only drawback are those damned stains! Could the baking soda be the culprit? I noticed that Heather posted a deo recipe that contains Diatomaceous earth instead of baking soda. Is that the answer? Hi, I tried this deodorant recipe but I seem to be sensitive to the baking soda. I also haven’t found a homemade deodorant that works, I don’t care what oils I use or other ingredients. I’ve put bentonite clay in one, tried vitamin e oil in one, all different oils but not as much as you did here, I also found one that suggested putting a probiotic in the recipe. So far none have worked. The shea butter is also a no go for me. Any suggestions? Is it ok to use tapioca starch in place of arrowroot? I use Mango butter! and it is great!!!!! Hi there, I follow the instruction on how to make the coconut oil home made deodorant. This is the best deodorant I ever used. I’ve been getting a rash every time I use any deodorant for the past couple of years, and I tried so many of them from regular to natural deodorants. I decided not to use deodorant and my skin cleared up but my body smell is too strong that it is not a permanent solution. After using the coconut oil home made deodorant my body odor problem got fixed and no more rash. However, I’ve been getting lumps under my armpits, this lumps comes and goes, some small and some big. I am reluctant to stop using this deodorant as is the only one that works for me. I am wondering if I mess up with the ingredients (coconut oil, baking soda, cornstarch and essential oils). I used regular cornstarch and wonder if I should have used arrow root or non-GMO cornstarch. Do you know if other people have had this problem and what they did to fix it. Any suggestion you might have is greatly appreciated. I’ve been using this for about 2 months, and have JUST started to develop a reaction. Would you recommend an armpit detox before resuming use? I went straight from commercial deodorant to using this recipe. Hello, I am reading the comments about the coconut oil, but there is no coconut oil mentioned in the recipe. Mine turned out so dry, I really can’t use it. What am I missing? The base of this recipe used to be coconut oil, but I changed it to shea butter because I found that it absorbed better. If yours is dry my recommendation would be to add more shea butter. I am concerned that the use of coconut oil will stain my shirts if it melts. What are your experiences with this? This is the best natural deodorant I’ve found. Works and I can make it smell ANY way I want, YAY. I have one question. I’d like to make it so that it can be used in a push up stick…. do you think if I added beeswax to it that might work? Thanks for any input you may have. Hi: The recipe that is listed now – Apr of ’18 – does not have coconut oil in it. Only shea butter. I’m wondering why it was taken out? I found that the shea butter absorbed better and kept my underarms feeling more dry. This recipe does work indeed. I attempted the change to natural deodorants a few years ago with a recipe based on coconut oil, cornstarch and baking soda. The result were oily shirts, smelly armpits and some embarrassment – needless to say I was not converted and returned to strong aluminium deodorants until a few months ago. I need to add that I tend to sweat a little more than others, especially in the overheated winter season. Finally, I gave the natural deodorant challenge another chance and tried your recipe above. Sheabutter and arrowroot powder make all the difference – goodbye to oily shirts (and occasionally hello to yellow armpit stains, which can be blamed on my impatience and wash out easily). I have found that the deodorant keeps my armpits fresh and dry for at least as long as my “super strong”deodorants did – and on the few long, hot days that they fail towards the end – I can guarantee that the other deodorants did, too. This is a great alternative to store-bought stuff and I’m not looking back. One more thing: I have noticed that the texture of the final product was less creamy and more solid than your result – I guess this is due to the varying quality of sheabutter and temperature. That’s not an issue at all – it’s just easier to use a spatula than my fingers to get it out of the jar. Thank you for your inspiring recipes – I love their simplicity, which makes natural alternatives much more accessible to anyone. Heather, have you ever tried milk of magnesia? I use kroger brand plain milk of magnesia and add about 10-12 drops of tea tree oil to a whole bottle. I store in a plastic squirt bottle. I squeeze about a nickel size amount on my finger tips and press my other fingers onto it and apply to pits. Can blow dry but usually dries fast while dressing. I’ve used this for 7+ years and I don’t stink. Even the next morning most of the time! So cheap, so easy, so reliable! You don’t need all these ingredients and preparation time, all you need is a simple half tea spoonful of soft organic baking soda in the palm of your hand and a few drops of water then rub it under your arms and you will be completely odourless for 24 hours! Really this is the perfect deodorant and it’s organic and it won’t stain your clothes. If you shave your armpits then just wait a few hours before using the baking soda. I read a very interesting article “Microbial Odor Profile of Polyester and Cotton Clothes after a Fitness Session” from 2014 which confirms my personal experience, that polyester clothes increase odor. Apparently, a completely different bacterial flora is established with different fabrics. My experience is that after avoiding toxic deodorants and antiperspirants as well as polyester clothes will gradually encourage a less odor producing bacterial flora. This is a gradual process, but most people eventually don’t need regular use of deodorants after about a year. Some of us cannot use baking soda. I had a bad reaction to baking soda in deodorant; a rash that burned and itched. Arrowroot seems to work quite well for me, as does organic cornstarch. Is grapefruit essential oil okay to use in this? Thank you Heather, I wanted ask you about how I can prevent my homemade creams with natural prevent ? I’m so happy to hear that, Alana! Thanks for taking the time to let me know. Is there supposed to be coconut oil in the recipe above? I see comment mentioning coconut oil but I don’t see it in the recipe. Thank you so much for this recipe. However, I would like to use coconut oil instead of shea butter. Could you please tell me how many tablespoons of coconut oil I should use with 3 tb of baking soda and 5 tb arrowroot powder. Thank you. ? How could I make this more into a gel like deodorant. The other way will be clumpy in my armpit since I’m a male. My husband uses and doesn’t have an issue with clumping, so you might find that this recipe is more compatible than you expect. You could try using aloe vera gel as a base but I’m not sure how that would work. I started using this recipe about a month ago (I didn’t add much essential oil on this first try though because I’m not a fan of scents and didn’t know how strong it would be). It seems to be effective but now instead of BO I am noticing a different smell. Maybe rancid shea butter after sitting in a hot pit all day? It doesn’t seem really strong but it isn’t a good smell and it’s building up in my clothes. Any ideas? I am currently living in South Korea, I used crystal deodorant at home (South Africa) but it is about to finish. I am so glad I found your site and this recipe to make my own. I have sensitive underarms and I think they are going to love this! I can see how much and work goes into your blogs so thank you so much for your great content and hard work. Hello and thank you for the recipe. Can tapioca flour substitute for arrowroot effectively? I haven’t tested it in this recipe but I think so. I love this natural way of creating a deodorant. I don’t need this that much but i love to create one. Thanks for sharing!